When a woman finds out that she is pregnant, she is overwhelmed by one of two emotions: Dread or Joy. This depends on how much she wants the child(ren) in question. But what happens when you think you’re pregnant, only to realize that the situation is much more dire than you thought? Lauren Knowles of Perth, Australia thought that she was pregnant again after birthing two beautiful children. After about seven weeks into what she believed was her third pregnancy, she began spotting heavily and rushed to the hospital for a scan. That is when she received the horrible news that she was not going to have a child. Instead, she was enduring a molar pregnancy and the cluster of cells was cancerous. Lauren had the cancerous tissue removed and underwent extreme chemotherapy, but the tumor continued to grow at an alarming rate. It wasn’t long after this that she felt the “urge to push” and “gave birth” to the cancerous mass on the hospital toilet. 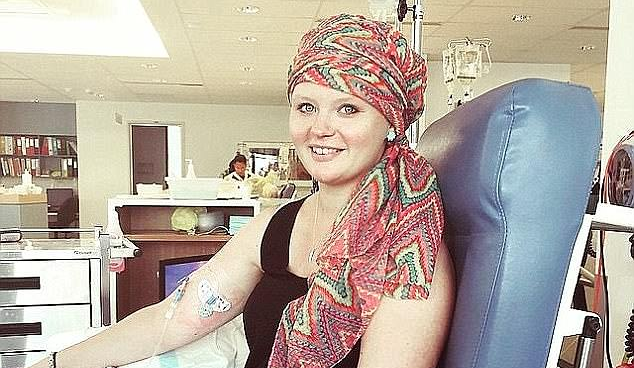 The mass was the size of a pear and once it was out of her body, it meant that she was officially cancer free. While her doctors warned that she was going to have problems conceiving in the future, just one year later she found out that she was pregnant with a now 10 month-old girl named Indi. “The tumour grew in my womb the same way a baby would, the same hormones were produced and my pregnancy tests always came back positive,” she explained. I couldn’t imagine going through something like that and I feel incredibly sorry that this woman had to endure something so awful. The fact that she got through it and was able to have a perfectly happy, healthy baby girl in the year after gives me hope for all the other women out there who are suffering from a molar pregnancy.